In recent decades, many emerging economies benefited from rapid economic growth, which allowed them to gain a more prominent role in the global economy.1 Emerging economies drove growth throughout the economic crisis. In 2009—the worst year of the crisis—the combined GDP of advanced economies contracted by 3 percent while emerging economies grew by 3 percent. Overall, between 2007 and 2013, emerging economies grew by 5.9 percent annually, five percentage points more than advanced economies. These radically different trajectories accelerated the shift of economic power from advanced economies toward the emerging world, which in 2012 accounted for more than half of global output for the first time in recent history. High commodity prices and better access to financing thanks to the inflow of capital, often from advanced economies, go a long way toward explaining these positive developments in recent years. The slowdown can be attributed to several factors. Overall, commodity prices, with the exception of oil prices, have stagnated or started to fall. At the same time, the outflow of capital and the phasing out of accommodating monetary policy in the United States have created further instability and worsened credit access conditions for emerging economies. In addition, emerging economies for the most part did not use the recent spell of high growth to implement the structural reforms needed to boost productivity and build competitiveness. The necessary reforms are particularly critical in three areas: (1) boosting competition, especially in strategic sectors of the economy, by removing bottlenecks and barriers to entry; (2) making the labor markets more flexible and more effective at using all existing talent; and (3) improving the efficiency of public institutions, which is also crucial to ensure an effective implementation of structural reforms. The Global Competitiveness Index (GCI) reveals the poor performance among many of the 20 largest emerging economies—which together account for 27 percent of global GDP—in terms of the functioning of their institutions, as well as in establishing efficient product and labor markets (see Table 1). In particular, six of those countries rank below the 100th mark: Argentina, Brazil, Egypt, Mexico, Pakistan, and Venezuela. A further eight countries rank lower than the 100th mark in at least one of these three categories. Note: Countries are listed according to their overall GCI rank. Ranks are out of 144 economies. 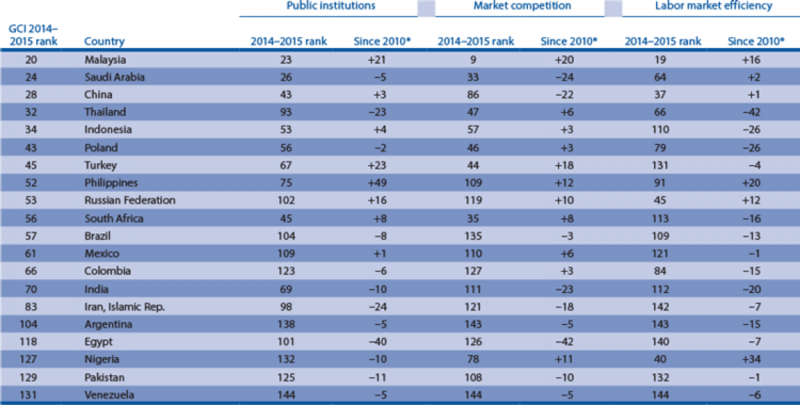 * Change in ranking between the 2010–2011 and the 2014–2015 editions of the GCI. Furthermore, the GCI results also point to a lack of progress over time. Only three countries have recorded higher values in all areas since 2010: Malaysia, the Philippines, and the Russian Federation. The latter, however, still ranks a low 119th in market competition and 102nd in public institutions. Among the BRICs, China has lost 22 places in terms of market competition since 2010, and both India and Brazil have lost considerable ground in all three areas. These results highlight how important it will be for emerging economies to promptly and efficiently implement structural reforms. Those reforms are necessary to increase their competitiveness, build their resilience against future external shocks, allow a more efficient allocation of resources, and facilitate the transition toward more productive activities. 1 For the sake of readability, we use the shorter formulation, “Emerging Economies,” to refer to the group of “Developing and Emerging Market Economies” as defined by the International Monetary Fund in its publications, such as the World Economic Outlook series.